Birds, fish, and other species don’t recognize international borders and need wetlands and habitats located in different countries in order to survive. Many of wetland fauna, including some fish species, waterbirds, insects such as butterflies and dragonflies, and mammals such as otters, are migratory species whose conservation and management also require international cooperation. Consider the migration of the Pacific Golden-Plover. This species breeds chiefly along the Arctic coast of Siberia and in limited areas of the Alaskan coast. Some of the birds probably migrate south through Asia to winter quarters in Japan, China, India, Australia, New Zealand, and the islands of Oceania. 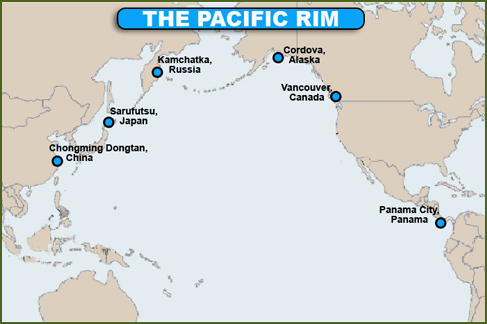 Others go south across the Pacific to Hawaii and other islands in the central and southern Pacific. Migrating golden-plovers have been observed at sea on a line that extends from the Aleutian Islands to Hawaii. While it seems incredible that any birds could lay a course so accurately as to make landfall on these small, isolated, oceanic islands, 2,000 miles south of the Aleutians, 2,000 miles west of Baja California, and nearly 4,000 miles from Japan, year after year Pacific Golden-Plovers make this transoceanic round-trip. The Fraser River is the longest river in British Columbia, Canada originating in the Rocky Mountains near Mount Robson and flowing for 1400 km (870 mi), into the Pacific Ocean at the city of Vancouver. Coastal lowlands and marshes of the estuary provide critical refueling opportunities for long-distance migrants such as the Lesser Snow Goose, which nests in Wrangel Island (Russia) and sometimes makes non-stop flights of over 2,500 km in its southward migration to wintering grounds. Almost all of the world's population of western sandpipers stop to rest and refuel during their massive migrations between Alaska nesting grounds and wintering sites from California to Peru. In addition, more than 35 other shorebird species rely on this estuary throughout the year. Green-winged Teal, American Wigeon, Gadwall, Northern Shoveler, Northern Pintail, Lesser Snow Geese, Trumpeter Swans are the most commonly-observed waterfowl species seen inshore. In deeper waters, large rafts of diving ducks such as Greater and Lesser Scaup and Surf Scoters congregate, along with Double-Crested Cormorants, Western Grebes and many species of gulls. Dunlin and Western Sandpipers feed in flocks of thousands on intertidal mudflats, marshes and lowland habitats inland of the dykes. Bald Eagles, Northern Harriers, Red-tailed Hawks, Peregrine Falcons and Short-Eared Owls are just some of the birds of prey to be seen in the river delta. 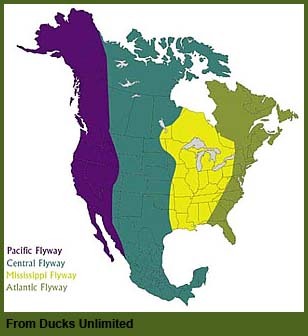 For some species such as the Barn Owl, the delta represents the only site in Canada with mild enough winters for the species to remain year-round. British Columbia's estuaries are among the richest in the world. The Fraser River is home to over 400 species of vertebrates, thousands of plants, and a myriad of small invertebrates. The Fraser River forms the largest estuary along the Pacific Coast of North America and drains over 200,000 square kilometers of British Columbia. River sediments meet the currents of the Strait of Georgia and are deposited onto the nearly 30,000 hectares of the estuary's intertidal marshes and mudflats. The climate is mild, and there are plentiful foods ranging from marine fish and invertebrates to grasses, rodents, and amphibians. Millions of birds all congregate at the mouth of this river, providing a wonderful wildlife viewing spectacle. The Fraser River is the largest producer of salmon on the entire Pacific Coast of North America. Annually, millions of anadromous (migratory) adult salmon migrate upstream to spawn along small streams along its length and up into the connected waterways. Millions of young fish hatching in these areas spend their early life cycle in these upper reaches, and eventually descend to the estuary on their way out to oceanic habitats. Estuarine marshes, mudflats, floodplains, sloughs and river channels are all critical feeding and rearing areas for these and other fish during their transition between river and marine stages of their life cycle. Pacific Herring, Sturgeon, Eulachon, and Smelt are also abundant fisheries locally, as are Dungeness crab, shrimp and other invertebrates. The Fraser River Estuary has received global recognition as a Wetland of International Significance and has been proposed as a WSHRN site. (The abbreviation WSHRN stands for the Western Hemispheric Shorebird Reserve Network, an international initiative to identify and protect habitats in key stopover points used by shorebirds during their long migrations across North and South America (the Western Hemisphere). 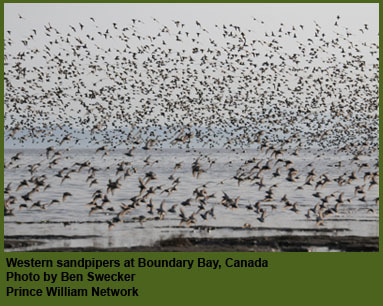 The Fraser delta ranks very highly, since almost all of the world's population of western sandpipers stop to rest and refuel during their massive migrations between Alaska nesting grounds and wintering sites from California to Peru. In addition, more than 35 other shorebird species rely on this estuary throughout the year. Sarufutsu Town is located 30-40 km south from Cape Soya, Japan’s northernmost point in Wakkanai city, on the side of the Okhotsk Sea. It comprises a mosaic of lagoons, wetlands, and rivers in the vast wilderness of Sarufutsu and visitors are greeted with its intact nature. There are 6 rivers running through the Sarufutsu wilderness including the Sarufutsu River with their headstreams flowing from Soya Hills. They run gently and windingly into the Sea of Okhotsk due to their small elevation gains up to their upper reaches. Four in those six rivers – the Sarufutsu, Chiraibetsu, Sarusuberi, and Onishibetsu rivers – support the populations of Itou (sea-run taimen). Kamchatka is recognized as one of the World Wildlife Fund’s Global 200 Ecoregions, due to its globally significant biodiversity. 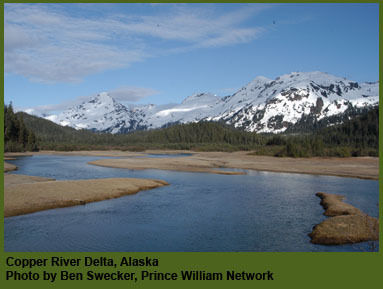 Its ecosystems include arctic and alpine tundra, boreal coniferous forests, temperate deciduous forests, freshwater lake ecosystems, freshwater wetlands, and marine inshore waters. Russia's 1000-mile long Kamchatka Peninsula contains a vast network of rivers that remain free-flowing from headwaters to ocean and are virtually unaltered by human development. This region produces up to one-fourth of all wild Pacific salmon and hosts the greatest diversity of salmonid species on Earth. Many of Kamchatka’s rural and indigenous people still rely on salmon for basic needs. Salmon support one in five jobs in Kamchatka and provide food for over 137 species. Kamchatka provides nesting and stopover sites for millions of waterfowl, supports the largest wintering area for Steller’s sea eagles, and hosts the highest brown bear density in the world.